I’m really worried of JaeJoong, Junsu and Yoochun. I know these guys are hurting so much right now because of all the things that happened for the past weeks. I feels so sad reading JaeJoong’s tweet because I just feel that he’s being too hard on himself. JaeJoong cares so much for his fans and I know how bad he must have felt after the sasaeng controversy broke out but I hope he’ll remember that we are still here to support him. Yes, he made a mistake but that doesn’t mean that we will turn our backs on him.We know that he’s human who commits mistakes but despite his imperfections, we, his fans, will still love him. I just hope all three of them will stay strong and try to think positive despite these recent incidents. Earlier this month, local news outlet “Dispatch” turned the Korean entertainment industry upside down by releasing an audio file of JYJ members physically and verbally abusing fans. Earlier today, “Dispatch” released another audio file (below) involving the members of JYJ assaulting their “sasaeng” fans. JYJ’s legal attorney, Sejong, stated, “The file was illegally recorded. Releasing the file without confirming it with the party involved is considered defamation and an invasion of privacy. Another nice article from TopNews. Male Group JYJ has finally completed their one-year long World Tour with concerts in Chile and Peru. Starting in April of last year, JYJ held a world tour which was true to it’s name; beginning in Thailand and encompassing Asia, North America, Europe, and South America, with over 210,000 fans mobilizing to see the shows. JYJ became the first singers to hold successful, exclusive concerts in many of these stops, a feat that other internationally known groups in the Kpop category have not even achieved. Starting from around 1 to 2 years ago, newspaper and media started to rapidly use the term “Kpop Fever”. The general public saw these words and believed the hype, especially after watching the extensive coverage of SMTown in Paris. However, though they were not the first to hold concerts [overseas], JYJ has been getting much attention because they did not perform as part of a company’s joint concert, but rather held an exclusive concert with just songs from their one group, JYJ. In Japan, the recent surge in Hallyu is being led by a crowd of newer groups such as KARA and Girl’s Generation. Because of this there are naturally many joint K-pop concerts held. Most of these concerts, however, only use the “K-pop” brand name to sell expensive tickets that range from 7,000 to 9,000 yen and feature performances by groups that are neither popular in Korea or Japan. Of course, most of the seats in concerts such as this remain empty. Seeing occurrences such as these, many comments were made by the Korean public on SNS sites about how they were ashamed to be part of “Hallyu”. JYJ, however, did not fall on this path. Instead they became the first group ever to successfully perform in North America, Asia, Europe, and South America by using nothing other than their own music and names. After the South American concerts were confirmed, there were even many demonstrations held by fans requesting a JYJ concert to be held in Mexico as well. However, in reality, we are not able to see JYJ’s performances in the countries where they should mainly be active in; Korea and Japan. That is because their ex-companies, SM Entertainment and Japan’s AVEX, are covertly (though a bit too obviously) interfering with their activities. In a recent fan meeting, the JYJ members stated “We want to hold a concert in Korea at this time, but there are too many restrictions holding us back, including renting a venue, employing staff, and more”. Also, the members have felt troubles in trying to release albums because there were few distribution companies that would readily take them. In addition, because of frequent cancellation of Japanese concert venues, JYJ had to hold their concerts by hiding the venues and only announcing it to the audience that would be attending, as though it was a ’007 secret mission’. For example, the “JYJ Unforgettable Live Concert” which was held in Japan last fall faced many problems even during the preparations. There were many incidents, such as the ticketing website being hacked and the sudden cancellation of the bus rental company services, that caused even the skeptics to see that AVEX truly was interfering with the concert. (Also, after the concert many letters were revealed showing that the Ibaraki mayor, government officials, police, and even employees from the sound and concert equipment companies were threatened.) As they started to realize that it would be difficult to hold concerts in their usual home bases of Korea and Japan, JYJ started to look towards places that no others have before. Because of this, the members decided to hold concerts in North America, Europe, and South America. JYJ even held a free showcase tour in the USA after releasing their 2010 album “The Beginning”. After seeing the great amount of popularity they had in the USA, they decided to put North America as their second stop after Asia during their 2011 World Concert Tour. All the concert venues and tour locations were decided through AEG Live, an international promotional company, and were mainly sponsored by Samsung. After hearing their news, it was plain to see the difference between those concerts and the ones that were held in Korea and Japan, because there are no large sponsors or promoters for concerts here [t/n: meaning, usually the group’s own entertainment companies serve as the sponsors and promoters for concerts in Korea and Japan]. 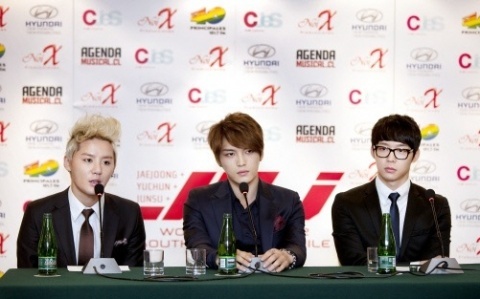 JYJ, who gained much confidence with the popularity of their North American concerts, held shows in Korea during June. However, the locations of these concerts were not in Seoul, but rather Busan and Gwangju. In actuality, most singers never hold concerts located in these provinces unless it is part of a full scale nationwide tour. Even when JYJ were part of TVXQ, they never held full concerts in any province or city in Korea other than Seoul. Whenever they held full concerts, fans from other provinces would rent buses to come to Seoul and then go back home. However this time, fans from the whole nation came to Busan and Gwangju. This showed that there were no places in the metropolitan Seoul area which JYJ could rent to hold concerts. But the popularity of JYJ couldn’t be contained as 24,000 fans from all over the country came to see JYJ’s concerts in the provinces. After the World Tour concerts in Korea were completed, two new surprises shocked the fans; one being a new JYJ album and the second being concerts held in Spain and Germany. The level of awareness of Korean singers in Europe remains very small. Up until that point, the only idol singers who performed in Europe were part of SMTown. That concert was a well-veiled, vain effort made by the Korean government which sponsored them and over-hyped by the Korean media, who used phrases such as “Kpop Fever” many times in their reports. Korean residents abroad stated that the concerts were filled by mostly Asian and Hispanic fans. But rather than a large-scale concert with tens of thousands of people, JYJ have started with small concerts. They had the first solo concerts in Europe in Spain and Germany with 3000 audiences each concert. In a sense, it might have been a small stage to them, who have stood on Dome stage filled by more than 50,000 people. However, to the JYJ of today, every of such small stages were precious. Thus, at that time when JYJ had performs in Europe, on the internet in South Korea, a controversy was aroused, that unlike some reports from media, JYJ’s European concert was empty. Those controversial photos were taken when the concert has ended, after most of the audiences have left and there were only the fans that were still waiting, wishing for an encore. Anyway, JYJ, the first Korean artist who successfully completed solo concert in Spain and Germany, have come back to Korea and prepared for their individual activities such as musical and drama. However, some months later, we got surprised again that they would hold concert in South America. In the case of South America, before JYJ, groups such as BEAST, 4minute and other Cube artists had a united concert in Brazil. Once again, JYJ pioneered the way that other singers haven’t taken. JYJ’s members and the staff have left for South America with great expectations, far from reporting their departure, Korean media made a noise about the video and audio files which were taken 2~3 years ago after the lawsuit. It was the sasaeng controversy. Also, this problem popped out after they have left for South America. Although the majority of the media used the term ‘sasaeng fans’ to report about the controversy which was as big as the name value of JYJ, what sasaengs have done to JYJ’s members were so unimaginable that they should be called ‘criminals’ instead of ‘fans.’ They hit the members, took picture of a member who was sleeping in a male-only sauna. They even intentionally caused car accidents, etc. It was time for the pus that has festered in the fandom since their debut until now to burst. JYJ’s fandom even created the word ‘sasaeng criminal’ and spread the brutality of ‘sasaeng criminals’ via SNS, blogs, etc. No matter what the intention of the very first media that reported [about sasaeng issue] is, the majority of the media gave remarkable reports on the problem of ‘sasaeng’ instead of stating that it was JYJ’s fault. The term ‘sasaeng criminal’ was even used. JYJ’s members, who have arrived at Peru after twists and turns, entered the press conference hall with a heavy expression instead of excited expression with anticipation for the concert. Along with the talk about the concert, they also talked about the ‘sasaeng’ controversy in Korea. The members used the expression ‘a prison without bars’ when talking about sasaeng’s acts. JYJ’s members said, “No matter how we tried to avoid them, we were stuck in the place and the mental pain kept increased. In the beginning, we tried to endure it, comforting ourselves that it was the love from fans and they are the fans who liked us. But day by day, the level has gone up high and our daily life collapsed. In such indescribable pain, we wanted at least to break away from the torments.” In the end, they said with heads lowered, “We would like to apologize for our wrong acts in the past.” The press conference, where JYJ should have expressed their expectations and aspirations about the concerts in South America that they have never visited ever since they were born, has become a place of explanation and apology for the controversy in Korea. However, in such controversy and criticism, JYJ have finished the concerts in Chile and Peru in great success. They have mobilized about 9000 people for their concerts in Peru and Chile. Especially in Peru, the last stop of the concerts, the airport side had to let them leave through VIP passage because so many fans have gathered when JYJ arrived. Featured in a special broadcast on Korean TV, their visit and concert were largerly reported by even Reuters and CNN Chile. JYJ did their best in South America concerts, even singing ‘Intoxication,’ Kim Junsu’s solo single released in Japan. As a result, the local fans were very excited and many fans even fainted during the concert. Fans told the reporters that went to Peru to cover the event that for South American fans, being able to see JYJ and their group was the ‘Event of a Lifetime’. In this way, the first world tour brought many memories. At the end of the tour, CEO Baek Changjoo from JYJ’s agency, C-JeS Entertainment stated: It is because they are JYJ that they were able to do a World Tour. They are extremely popular so it makes it possible for them to have an exclusive concert in any country in the world. We have now gained confidence and experience. Because of this reason, we are looking forward to next year’s world tour. Korean press reported on the success of these concerts using phrases like “Kpop Fever” and tried to attach the term ‘K-pop’ to JYJ’s achievements. That should not be the case, however, since JYJ’s World Tour was done using exclusively JYJ’s music and name, unlike the many joint concerts that are done around the globe. 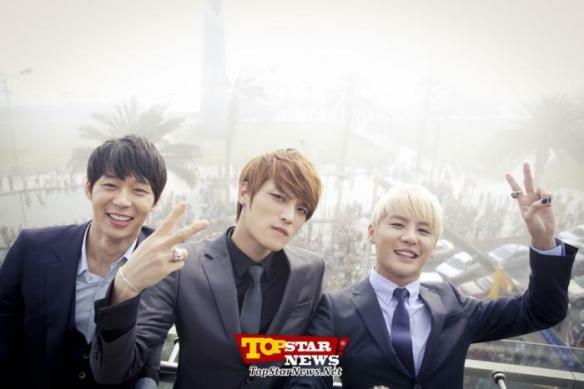 Many fans describe the outcome of this World Tour as being one fueled by ‘JYJ-pop’, and not ‘K-pop’. However, even with their successes, Korean media is cold when it comes to the fact that JYJ were the first Korean artists to complete this sort of World Tour. Even the names of the members cannot be brought up on entertainment TV media because of pressure from a large entertainment company. In reality, JYJ are like the Voldemort character from the ‘Harry Potter’ books [t/n: They-who-must-not-be-named]. 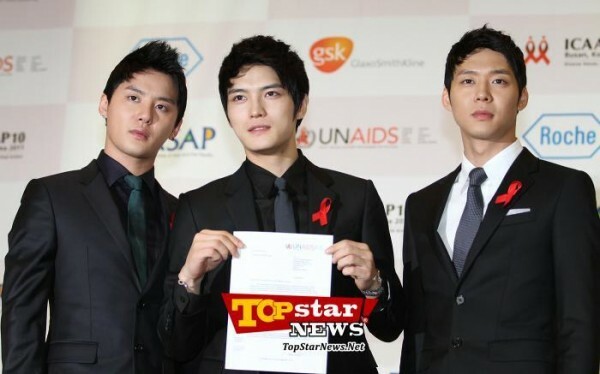 It has been over a year since the courts issued an injunction allowing JYJ to freely take part in entertainment media. However, JYJ only appeared as singer at celebrations such as Drama Awards and IAAF World Championships in Daegu: events which were not dictated by the entertainment departments of the broadcasting companies. Although JYJ have an unreachable amount of popularity, they are treated more like important state guests in their own country. They are recognized as actors or musical actors more than singers in Korea. It is saddening that they cannot release an album and appear on weekly music shows even though they are the unquestionably popular singing group, JYJ. Although no one knows how long the lawsuit with ex-company SM Entertainment will take, we all wish that the day where the members can freely sing on the stage and on television will arrive soon. During a press conference held in Chile on March 8, JYJ opened up about the recording of them verbally abusing fans in 2009. The JYJ members read their prepared statements with grim faces. I pity the boys for having to do this during the press conference for their South American tour. It’s so sad that this issue had to happen while they were about to have another epic concert in another country. But I am proud of the boys for their willingness to admit that at some point, they have done wrong. It takes courage to do that and I applaud them for being man enough to make a public apology like this. I just want to share some articles released in relation to JYJ’s saseng fans controversy. The JYJ members are constantly thanking their fans during interviews and through their own respective Twitter pages, so why did the JYJ members use physical violence and curse at these girls that claim to be their fans? Those of you reading this article, imagine that you’re a member of one of today’s hottest K-pop idol groups, not only in Korea, but you are also receiving extreme popularity overseas. Since your debut, you have consistently maintained your elite status as a top idol star, and the more famous you become, the more the media reports rumors in attempts to slander you. The moment you step out of your home, there are long lines of cabs who follow your every move. They follow you 24 hours a day to your hair salon, your way to work, and follow closely behind you when you crawl home after a long and exhausting day. Your overseas activities have never been publicly reported, but a throng of fans are awaiting you at the airport, overwhelming you with cameras and flashes, but that part isn’t so bad. If this were happening to you, how long would you have been able to put up with it before exploding? Some would of gone as far as most likely paying the fines and breaching the contract with their label, no matter how much the agency demanded. The above situations may seem fabricated, but for JYJ, it’s actually a reality. After JYJ debuted as part of TVXQ in 2003, they immediately rose to fame not only in Korea but all of Asia as well. The members featured on a few television programs and talked about these Sasaeng fans in the past. But back then, no one truly understood what they were dealing with, nor did anyone really care. Though they asked the fans to respect their personal lives, their request merely echoed back to them without much response. 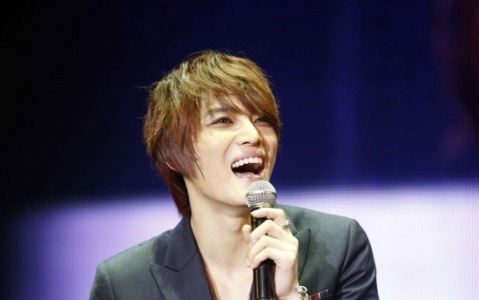 The Sasaeng fans who closely follow JYJ are fans who want to be well-known amongst the celebrities. They want the stars to specifically remember them, and they want to be a little closer to them than the other fans. On their blogs, they report on a daily basis what the stars were wearing, where they were going, and what they were driving. These then become the most-searched items on Korean portal sites late at night. The series of events that have recently surrounded JYJ show how much these Sasaeng fans have harassed the members, and how much the members were forced to grow accustomed to these fans. The number of these kinds of fans do not shrink in number but only grow with time, including not only fans from Korea but also from Japan, China, and beyond. In order to imprint their identity, the fans have done things like intentionally cause car accidents, and send their under garments stained with menstrual blood as ‘gifts’ to JYJ. What’s more, the fans have also broken into the members’ dorms to take pictures of themselves and sent them to the members. Over time, the more these sorts of situations arose, the more aggressive the members had to become in order to maintain their space. They used profanity against the fans not because they have ill intent, but in order to protect themselves from them. JYJ has done everything in their power to try and keep the fans at a safe distance, but because they can’t, the members have now actually grown afraid of these Sasaengs. There have been a few times where the news reported stories of celebrities being stalked by fans. But when it comes to idol celebrities, the situation is completely different. Because the fans’ of idol groups are generally young minors, no legal action is taken against them, and are just let off with a warning. But it seems as though these measures only fuel the Sasaeng fans to chase the celebrities even more closely. It’s true, it’s a relief that these celebrities are able to maintain mental stability and still stand and perform before the public. From here on out, the public needs to understand Sasaeng fan activity as a type of evil in society. All reporters and media outlets who receive tips and information from these Sasaeng fans and write articles with ill-intent in order to slander the images of these celebrities who are working non-stop to promote K-pop globally, need to remember their real duty and responsibility. I find this op-ed article very interesting and unbiased. It looks like it was a well-thought of article that seems like a breath of fresh air from all the bad publicity that other media outlets have been throwing at JYJ. I’m happy to know that there are still members of the media who knows how to analyze things before releasing a report. I just wish all the Korean media could do fair and factual articles such as this. I’m finally back from a 3 months hiatus. I’m happy to be able to post on my blog again because I really missed updating about JYJ news and their activities. I was forced to be on hiatus for a couple of months because I was busy with work. I was so stressed and pressured that I didn’t have the energy and the time to update anymore. I’m actually busy until now but I just felt the urge to blog again because I think that my blog’s idleness for 3 months is unforgivable (at least for me). Haha. I can’t promise to update often but I will definitely try to do it when I have free time. So, a lot of news about JYJ came out while I was on my blogging break, which I didn’t get to share to my readers. I’m really sorry! I apologize especially to those who had been following my blog for JYJ news. I cannot post all the past news here because there’s just too many of them but I did post JYJ’s twitter updates translated by Dongbangdata.net starting from the last one I posted last December 2011 until their latest translations this March 2012. I posted them in their corresponding dates to make archiving a lot easier. What more can I say? Junsu is definitely the king of musicals! Also, I love Junsu’s blonde hair! He is so freakin’ hot. Haha. He actually looks like JaeJoong during their OJBH days every time his blonde hair is styled upwards. I’m not sure if this is confirmed but if it is, then it will really be an interesting drama to watch. I’ve always wanted to see what JaeJoong would look like if he were to play a role in a period drama. I’m excited! My condolences to Yoochun and his family. :( I’m glad that he’s staying strong for his mom and his younger brother Yoohwan. I hope he’ll feel better soon and I’ll always be praying for him and his family. This is a pretty hot topic so I’ll write my opinion on another post. (Junsu, 5:13am KST) Arrived in LA…… Another… 11-hour flight awaits me…… Geez……. You’re kidding, right….? (Junsu, 5:30pm KST) What demons are expected to be driven away by this…. (Junsu, 5:41pm KST) We arrived in LA at 10am local time.. Our flight to Chile was scheduled to take off at 2pm.. but was delayed to 4pm.. and again to 7pm.. They say it’s a mechanical issue. People were finally able to start boarding the plane at 10… With the large sound of the engine, I thought that we were finally setting off…. but.. the pilot slammed on the brakes right before the plane lifted off from the ground…. (Junsu, 5:59pm KST) All in all.. I spent exactly 12 hours waiting at the airport… ate all three of my latest meals at the airport.. and finally when I thought we’d be setting off… The flight was cancelled in the end… Where should I go….